I am a child of the 70’s. 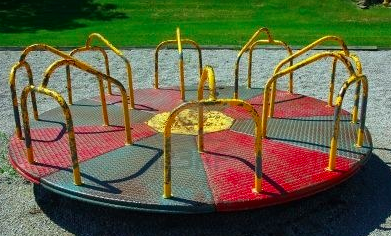 One of my favorite things on the playground was the merry-go-round. I believe they are rare in the USA as we have determined that cable TV is okay for our children but they might be injured from playground equipment. I digress. Today, I metaphorically thought about the merry-go-round. It is awesome when it is spinning! All the kids run around as fast as they can and jump on at the same time. It goes even faster when someone on the ground is pushing you around. But after a while you need to slow down. The most youthful equilibrium has its limits. Is it effective to just let go? Nope. Someone stationery could grab the handle and try to stop it. Depending on how fast it is going, that could be dangerous. The best way to slow it is for a person riding to put their foot on the ground and drag it until it comes to a stop. The merry-go-round is a cliché metaphor of life. More than ever, the merry-go-round of life is spinning but no one is putting their foot down. Many are throwing up their hands and tumbling off. The person on the ground won’t stop turning it. They aren’t riding the ride to know it is going too fast– unless they are listening. Why must we go to extremes to finally put our foot down? Perhaps I am on hiatus. Perhaps I am on sabbatical. While I wait, I think about what was and what might be coming. While I wait, I am letting my equilibrium stabilize. While I wait, I wonder if I have the stomach to get back on. I am not sure what to call this season of my life but I do know God has a plan and purpose. I wait. Perhaps enough of us will scream, “I think I’m going to hurl!” and life will slow down. I hope so.